Herbert Docena writes: Yesterday morning, President Gloria Macapagal-Arroyo declared an indefinite "state of national emergency" in the Philippines. Issued on the very week when Filipinos were celebrating the 20th anniversary of the "People Power" uprising which ended Ferdinand Marcos' 14-year dictatorship, Arroyo's order authorizes the police and the military the power to do everything necessary to neutralize "enemies" of the state, bans all protest rallies, and threatens to take over media outlets. Effectively placing the country under martial law, Arroyo has restored what Filipinos ended twenty years ago. About 10,000 of us defied the President's order and marched on Manila's busiest highway. We were violently dispersed. Twenty-six of us, including minors who were beaten up by the police, were arrested. 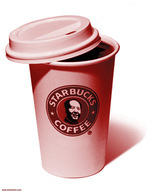 We've received a few requests for the 'Starbucks Mao' image from the Red Pepper China issue. So by popular demand, here it is - courtesy of our designer Tom Lynton. Clicking on this small version will bring up the full size image.